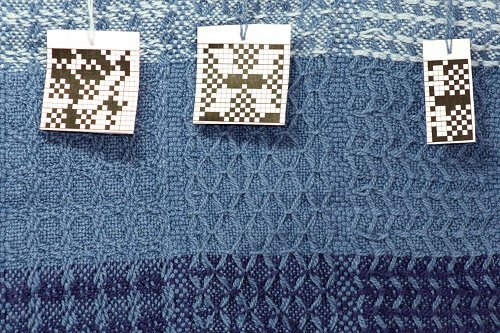 I had an extra week off work after the workshop with Kay Faulkner, so caught up on some year 2 classwork from Liz Calnan – oatmeal and dice weaves. Oatmeal weaves have a small overall pattern giving a textured, uniform effect without any stand-out features. It is also called crepe (not the kind that uses highly twisted yarns). I used the end of my waffle warp, a straight threading on 24 shafts in cottolin, for my samples. 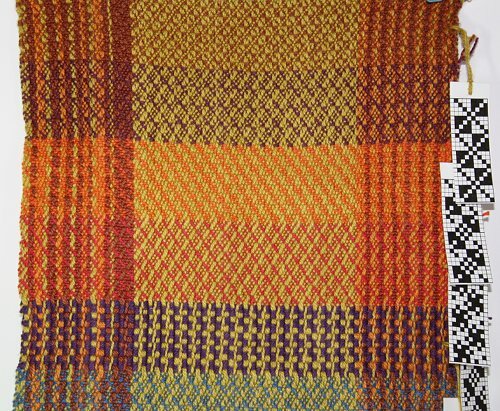 I experimented with lots of different colours for weft, so it looks a bit muddled. 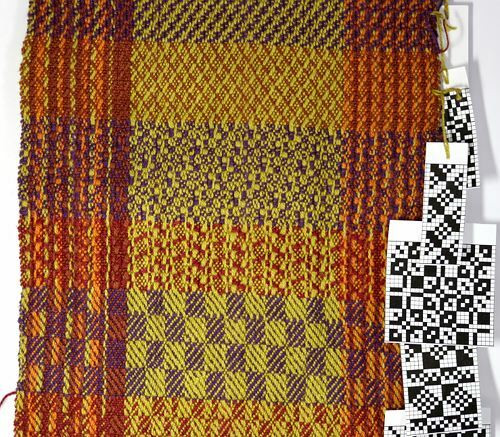 I’m also working on ways to keep track of what is on a sampler – so each section has a little hangtag with a printout of the liftplan (which look repeated since they are basically 8 shaft weaves, but I used a 24 shaft threading). This detail of the first section shows that it is a combination of warp and weft faced twills. 3/1 and 1/3 twills are combined in a grid. There is a “cut” between each of the quarters, horizontally and vertically – warp and weft swap face of the fabric going from one quarter to the next. Sorry about the dubious quality / colour of some photos – I have a new camera, and yet another learning curve! Given I had 24 shafts to play with, I tried combining a couple of dice weaves. The purple section just above centre has 3 dice weaves side by side, progressing to the right in each repeat. It creates a general busyness with a subdued diagonal which I find interesting. 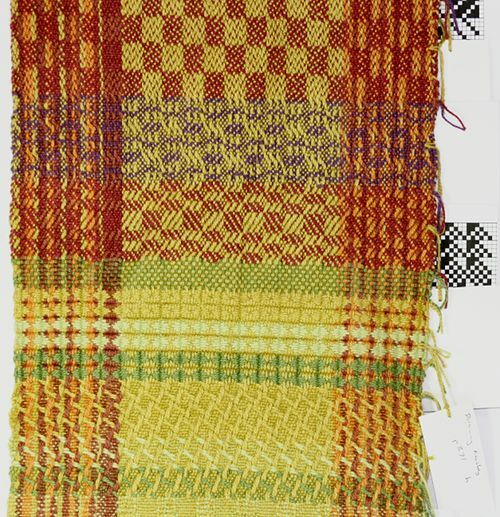 Below that in a reddish weft is two dice weaves with a fiddled bit between to make them fit. Towards the bottom in purple weft is a dice weave. In theory it should be a checker board of squares, but I wasn’t paying attention to my beat or picks per inch. In a dice weave there are warp and weft faced blocks of equal size. A similar idea in structure to the oatmeal, but at a different scale. The dice weaves I tried just didn’t thrill. I don’t know if it was the scale or that I couldn’t get an image of how I might use them, but after a little play around and with an eye on the amount of warp left I moved on. When working on waffle weave the class had got interested in texture weaves generally. We all spent some time looking through books for examples, and Liz in particular turned up a goldmine in a book by Doramay Keasbey. The photo above has some initial samples – only drafts that I could map to a straight 24 threading. Arriving at the end of the warp I decided to tie a short warp onto just shafts 1 to 16. After resleying this gave me a lot more possibilities. 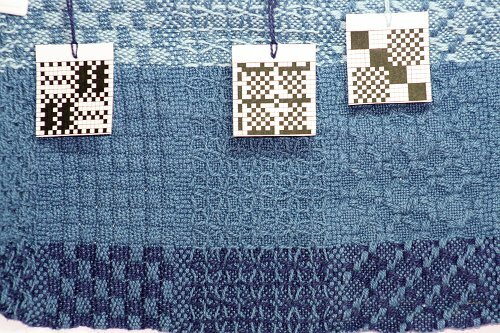 A bonus was that I moved to simpler wide stripes of blue with the idea that the colour variations could suit texture weaves. Actually, this colour choice was both challenging and exciting. My school’s colours were “blue and blue” – roughly navy and sky blue. I almost never use straight blues. Add in some turquoise or a dash of purple and I’m there, maybe. Just blue – so flat and dull! I’m so proud of myself 😉 ! The weaving was fun and I really like the results. I think this post has gone on long enough, so I’ll finish with some images (warp running horizontally). This nicely gets around the question of when and how I will use any of oatmeal, dice or texture again. The samplers will join the pile of future possibilities – we’re already on to the next topic in class.